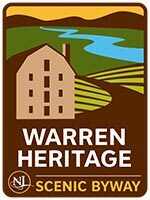 Located in the southern part of the Highlands, the Warren Heritage Scenic Byway travels from Greenwich Township to Hackettstown along Route 57 in Warren County. Route 57 follows a trail first established by the Lenni Lenape Indians to connect camp sites and villages with hunting and fishing grounds. The route was subsequently used by Europeans as they came on horseback and in wagons to settle in the region or to travel to nearby cities. As the early American population grew, farm produce, raw materials and manufactured products needed a way to and from markets in larger population areas such as the Lehigh Valley and New York City. In 1806, a turnpike was established between Phillipsburg and Morristown following the current alignment of Route 57 to accommodate increasing traffic. Route 57 is locally known for its scenic Highlands setting, rolling fertile valleys and streamside views. 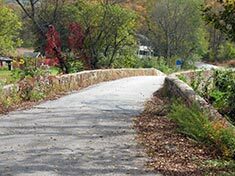 This historic roadway segment traverses the region's distinctive mountain ridges, Scotts Mountain, Pohatcong Mountain and Point Mountain, as well as the watershed of three streams, the Musconetcong River, Lopatcong Creek and the Pohatcong Creek. 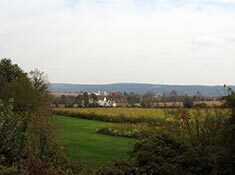 The valleys between these forested ridges are home to agricultural areas and feature the Pleasant Valley, Port Colden and Beattystown historic districts. The Musconetcong River which can be viewed from the roadway in the eastern portion of the route has received National Wild and Scenic Rivers designation along sections of the river. Along this Byway, motorists can view the Morris Canal, which in 1831 stretched 109 miles and required 34 locks and 23 water-powered inclined planes to overcome the greatest elevation change of any canal in the world. It has been designated as a Historic Civil Engineering Landmark. Today, evidence of the canal, including the towpath and related structures, remains at several locations within the Warren Heritage Scenic Byway corridor. The most obvious remnants of the canal that can be viewed include a boat basin at Port Murray in Mansfield Township, a portion of the canal and towpath in Washington Township at Meadow Breeze Park, a one-mile length of canal prism and towpath at Florence Kuipers Memorial Park in Hackettstown, and a guard lock and towpath trail at Saxton Falls in Stephens State Park in Hackettstown. 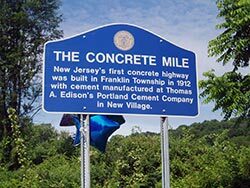 A historic marker on Route 57 in New Village (Franklin Township) identifies a one-mile segment of the road as "the first concrete highway in New Jersey and one of the first in America," built of Edison Portland Cement in 1912. Remnants of Edison's massive Portland Cement Company can be found on nearby Edison Road. This Byway is located in Warren County and runs from Milepost 2.07 in Greenwich Township to Milepost 21.1 in Hackettstown along Route 57.